Designs by Lisa Somerville: Welcome Baby! Thanks to everyone who left messages, emailed and sent cards for my birthday! You sure know how to make a gal feel special! Isn't this just the cutest image for a baby card! The image is from Our Daily Bread Designs Noah's Ark Set, stamped in Black on Watercolor Paper, then colored using the Marker Watercoloring Technique (past TJNL Technique, but one of my favorites). This card fits the Our Daily Bread Designs - Stamping in Time on Assignment Challenge - Use something NEW, Use Our Daily Bread Designs Stamps. New to me is the ODBD stamp set, I picked it up this past weekend at the Stamp Expo. The Amethyst panel is embossed with the Cheetah Embossing folder from Sizzix. I used a Sponge Dauber, Bliss Blue Ink and a punched out scallop to create the clouds. Glad you had a wonderful birthday! This Noah's ark is too cute!!! Your card is adorably beautiful. Love all the critters and great job on the overall composition. I need to use my sixxix stuff more! Love your card. Wonderful card!! Love the embossing! This is super! Luv all the fun of the design and color! Happy belated birthday! Love this ark and you're coloring is just super, Lisa. 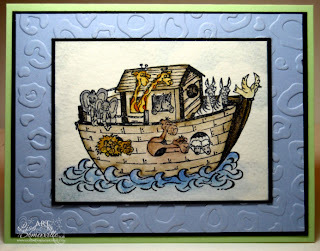 Sarah would SO love this card...she loves Noah's Ark themed projects! I love it too...really beautiful work on the coloring. Lovely baby card. Hope you had a wonderful birthday Lisa. Lisa, this is wonderful! Beautiful colors, coloring, and design! LOVE your NEW set, too! Thanks so much for playing Stamping In Time! Just adorable! I have a thing for ark cards...having twins and all! Love your version.